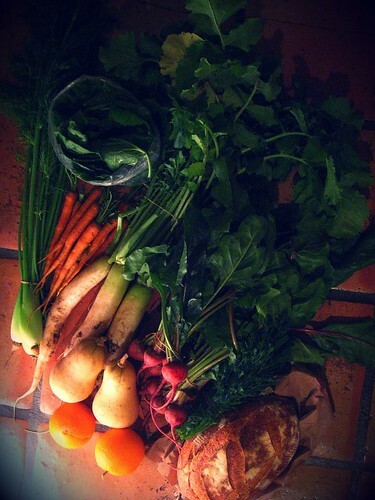 I ❤ the Tucson CSA, did you know that? Can you tell? I really do. I know, I know, it’s only week two – but there’s something deeply satisfying about leaving work at 5pm, driving down Speedway Boulevard to 4th Avenue, and seeing the Historic Y come into view once I’m on University Blvd. Walking by the boxes brimming with produce and picking up our share is the best feeling – there’s something deeply satisfying about the whole process. Also, being surrounded by a community of people who are supporting local farmers – eating from the land that we all live on and around – makes me feel connected to something great than myself. It’s just a really great experience all around. Somewhat indescribable, I guess. Either that or I’m just really inarticulate. I kind of feel like I’m back at square one again. What am I going to do with all of this stuff? I still have some leftover carrots from last week, so maybe carrot muffins or carrot slaw are in my future. I don’t think I’ve ever had Daikon radishes, so that will be new to me 🙂 I love beets, so that’s going to be easy. Maybe I’ll roast them and make a salad with some goat cheese. Do you have any other ideas? Butternut squash – AHHHHHH. Really, more squash? AHHHHHH! Even though I like to give my squash a hard time, I actually really like it. The humble squash doesn’t deserve to be teased though, so I’m going to spend some time brainstorming a good use for it. Things turned out pretty good with my spaghetti squash bread adventure, and I’m really starting to like the idea of using various types of squash in my baking. I’m going to spend some time thinking on this further. 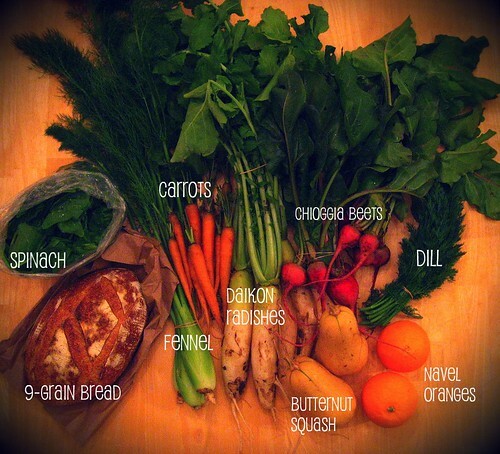 In short, I feel good being part of the local food system. I want to know my farmer. I love been challenged with cooking creatively. I’m excited that we’re eating healthier. I’m supporting local sustainable farming. I want to be kinder to my environment. Most importantly, I’m having fun! Interesting mix but oh, so healthy. I have friends involved in the same type of sharing both on Vancouver Island and in the Okanagan. They never know what they will find.